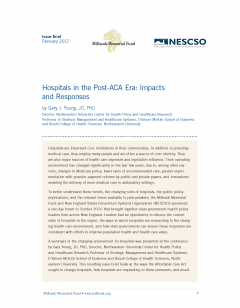 In the last few years, hospitals have had to respond to changes in the health care environment. Some of the challenges they’ve faced involve adjustments in Medicare policy, lower rates of uncompensated care, greater experimentation with provider payment reforms by public and private payers, and innovations enabling the delivery of care in ambulatory settings. To better understand these trends, the Milbank Memorial Fund and the New England States Consortium Systems Organization sponsored a one-day forum in October 2016 that brought together state health policy leaders from across New England. In addition to discussing the current state of hospitals in the region, participants focused on ways in which hospitals are responding to the changing health care environment and how state governments can ensure those responses are consistent with efforts to improve population health and health care value. This issue brief was written by Gary Young, JD, PhD, of Northeastern University, who gave a presentation at the conference on the changing environment of hospitals. The brief looks at the ways the Affordable Care Act sought to change hospitals, how hospitals are responding to these pressures, and resulting considerations for state policymakers.